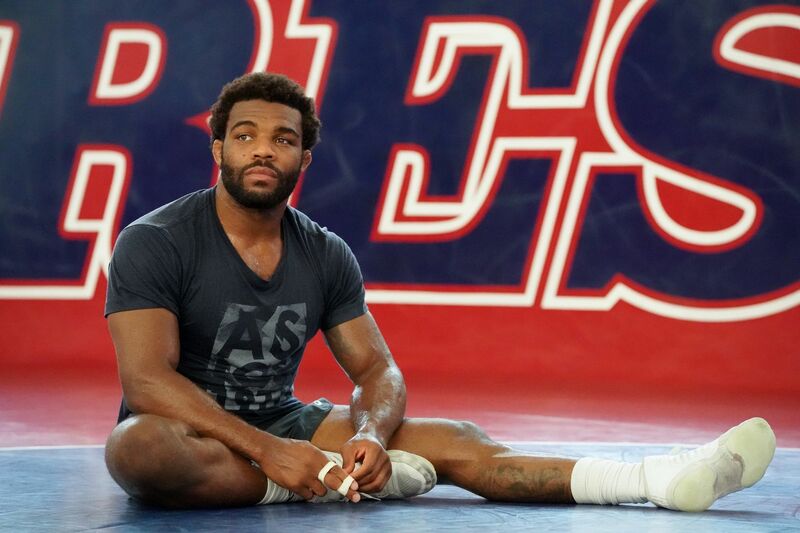 Burroughs rests during a workout earlier this month at the Palestra. Jordan Burroughs wrestling Iran’s Pehman Yarahmadi at an event in New York in 2016. Much of Burroughs' humility comes from what he still calls, without hesitation, the worst day of his life: a shocking implosion at the 2016 Olympics. "I have a newfound perspective from the fact that there's nothing that could ever happen to me in sport that could be more devastating than that day in Rio. There's always an opportunity to be your best until I hang up my shoes. And fortunately for me, my shoes still aren't finished." Burroughs eyes close friend and Philadelphia training partner Richard Perry during a training session. Burroughs, visiting Philadelphia for two friends’ weddings and his 30th birthday, pauses during a training session.